President Ronald Reagan proclaimed July as National Ice Cream month back in 1984. Since then, it’s been our patriotic duty to indulge in cones, cups and sundaes, whether for dessert or as an anytime treat to cool down in the summer heat. Even better, Sunday, July 17, is National Ice Cream Day. And you know what that means? To celebrate, we’ve found you the best places to get free or discounted frozen treats on Sunday. 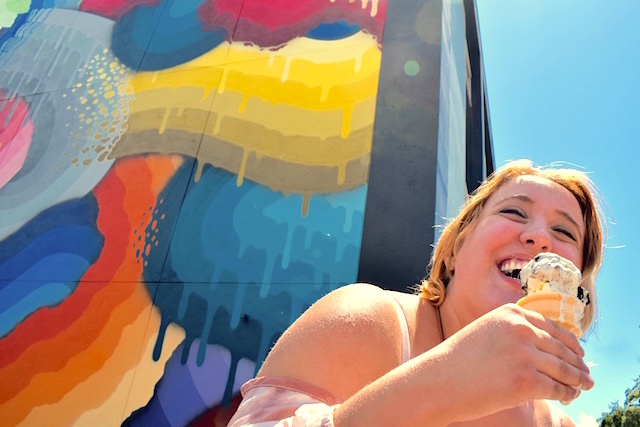 Make sure you stop by these spots for a scoop (or two) — and don’t forget the sprinkles! Friendly’s has been celebrating #Sprinklefest all summer long, offering $1.99 single scoops, $2.99 double scoops, as well as $2.99 Sundae Funday cones. Don’t worry if you’re too busy hitting up other ice cream shops on Sunday to make it there — this deal lasts all the way through Labor Day! Carvel is offering customers buy-one, get-one-free soft-serve cups or cones for any flavor on July 17. The offer is good for any size, too — so go big or go home! In honor of the United Service Organization’s 75th anniversary, Baskin Robbins is donating 75 cents from every ice cream float sold on Sunday back to the USO. Even better, you can upgrade to a free, freshly baked waffle cone with the purchase of a double scoop of your favorite flavor all month long. Do well and eat well! Sign up for the Blizzard Fan Club and DQ will thank you with a buy-one, get-one free ice cream cone offer. The best part? The rewards program also sends you a special treat on your birthday, making the sweet savings last all year long. Your Pie may be famous for its pizza pies, but did you know it also serves gelato and is giving it away on Sunday? And make sure to snap a photo of it — if you post it on Instagram, Facebook or Twitter using #ypfreegelato, you could win free ice cream twice a week for the rest of 2016! PetSmart PetsHotels will be offering free doggie ice cream sundaes all day long on Sunday while supplies last. I don’t know about you, but I know there’s nothing cuter than a pup stealing a lick off an ice cream cone — especially one safe for his tummy! Cumberland Farms convenience stores just rolled out a brand new line of ice cream sandwiches to celebrate National Ice Cream Day. From now through September 6, customers who purchase a 20-ounce Mountain Dew or Pepsi will get a free ice cream sandwich of their choice. If the kids are coming with for the ice cream festivities, make sure to stop by Monkey Joe’s. The indoor play center is offering free ice cream along with prizes and giveaways throughout the day. What better way to work off the sugar rush than in inflatable play areas? Your turn: Where will you be headed for sweet treats on National Ice Cream Day? Tell us in the comments below! Kelly Smith is an editorial intern at The Penny Hoarder and a senior at The University of Tampa. She is not ashamed to admit that her local Twistee Treat knows her order by heart.